If anyone is wondering (and some people are) why there won't be the same level of ridicule lobbed at General Mills over a Yoplait yogurt commercial as there was lobbed at Motrin over a back pain medicine commercial three years ago, it is because of precisely why the Motrin ad failed. The Motrin ad made poked snarky fun at "baby-wearing" customers. General Mills simply understood dieters, maybe too well. General Mills promptly pulled the commercial after some women and the National Eating Disorders Association said the spot promotes disordered thinking about food. So General Mills, with no defense (other than mentioning most people didn't see it that way) thought it best to take it down. The event was handled near perfectly, making it a non-event. The commercial, which featured a woman attempting to justify her decision to have a piece of cheesecake, does almost flawlessly capture how some dieters consider food decisions (with one or two lines becoming a bit more playful). And then offers a solution — cheesecake flavored yogurt. Overall, the advertisement is pretty harmless. And some people have questioned whether General Mills needed to pull the ad. Technically, General Mills probably didn't need to pull it (unless we now fault commercials for capturing truisms), but it was smart that they did. The complaints were originally raised by people within a target audience. And that's the point, even if the complaint seems somewhat contrived. What General Mills did right. • It thoughtfully listened to the complaints, in particular the National Eating Disorders Association. • It didn't elevate the issue by arguing the point, becoming overtly apologetic, or downplaying any concerns. • It removed the commercial, being careful to note that it may take longer to pull the ad in some markets. Since the ad was pulled, there has been some sliver of push back because some consumers feel it is ludicrous for companies to pull ads targeted by special interest groups. Specifically, some have said people need to take responsibility for their weight issues. While it's good these people appreciate that marketing is not to blame for eating problems, it's equally good that General Mills appreciates its customers. And that's what it is all about. Nobody really wants to run a commercial that makes some of its customers uncomfortable, especially with a longstanding customer-conscious reputation like the one established by General Mills. It's an especially smart move by the company, given it just recently acquired a 51 percent controlling interest in Yoplait S.A.S. 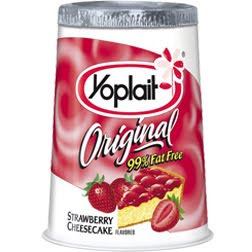 Original Yoplait, by the way, has two times the calcium of the leading yogurt and 50 percent of the daily value in every cup. Its cheesecake flavor has 170 calories, with 15 from fat. Related reactions from around the Web. • Does this commercial encourage eating disorders? by Lylah M. Alphonse. • Concerns over ED triggers cause Yoplait to pull their latest ad by Bree. • Yoplait Pulls Ad Accused Of Promoting Eating Disorders by Margaret Hartmann.